The World Bank has said that for the first time less than 10% of the world's population will be living in extreme poverty by the end of 2015. The bank said it was using a new income figure of $1.90 per day to define extreme poverty, up from $1.25. It forecasts that the proportion of the world's population in this category will fall from 12.8% in 2012 to 9.6%. Reducing poverty in the East Asia and Pacific region was highlighted as being key to global progress. In the region, 82.6 million are projected to be living in extreme poverty by the end of this year, representing a fall from 7.2% of the population in 2012 to 4.1%. In 1990, 60% of the area's population (999.2 million) lived in extreme poverty. 1990: 1,959 billion = 37.1% of world's population. 1999: 1,747 billion = 29% of world's population. 2012: 902 million = 12.8% of world's population. 2015: 702 million = 9.6% of world's population. However, the report's authors said the "growing concentration of global poverty in sub-Saharan Africa is of great concern". Extreme poverty in that region is seen as falling from 46.2% in 2012 to 35.2% at the end of 2015. But sub-Saharan Africa is projected to have about half the world's extreme poor by then, and the report's authors say they are concerned that poverty is falling too slowly there. South Asia was also flagged as an area where extreme poverty was concentrated, despite major gains in reducing poverty. The World Bank says the downward trend is due to strong growth rates in developing countries and investments in education, health, and social safety nets. "We are the first generation in human history that can end extreme poverty," World Bank President Jim Yong Kim said. But he warned that continuing the progress would be "extraordinarily hard, especially in a period of slower global growth, volatile financial markets, conflicts, high youth unemployment, and the growing impact of climate change". And the bank warned that poverty is "becoming deeper and more entrenched in countries that are either conflict ridden or overly dependent on commodity exports". QUIZ: Are there more poor people now than 200 years ago? 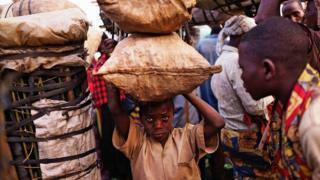 The United Nations recently announced its aim to end extreme poverty by 2030. It is one of 17 Global Goals unveiled at the UN General Assembly last week. The UN currently uses the World Bank's previous $1.25 a day income measure to define poverty. The report's authors say that action is needed to make this goal and that "business as usual policies are unlikely to be sufficient". Are there more poor people now than 200 years ago?